The holiday season comes alive as Rockefeller Center lights up for the 83rd Annual Rockefeller Center Tree lighting ceremony! There’s no stopping the holiday season spirit from coming alive, especially with the Rockefeller Center Christmas Tree. The iconic holiday symbol draws tens of thousands of people each year to New York City. It’s a tradition that began the year 30 Rockefeller Plaza opened, in 1933. This year’s 83rd Annual Rockefeller Center Tree lighting ceremony takes place on Wednesday, December 2nd with live performances from 7 p.m. - 9 p.m. at Rockefeller Plaza, between West 48th and West 51st Streets and Fifth and Sixth Avenues. The ceremony is free and open to the public on a first-come, first-served basis. The Rockefeller Tree will remain lit and open to the public to view until 8 p.m. on January 6, 2016. Visiting hours are held daily from 5:30 a.m. to midnight. This year’s tree was cut from Gardiner, New York (about 80 miles north of New York City) at the property of the Asendorf family. Albert Asendorf was just four years old when his family moved into their new home with the then 6-foot Norway spruce. The family tree grew to 78-feet tall four generations later and weighs 10-tons. The family said the spruce had outgrown its property, telling TODAY: “It kind of took over the whole yard.” While the tree will be missed, Asendorf’s partner, Nancy Puchalski commented that at least “it’s part of history” now. The tree will be lit with five miles of LED lights and topped with a Swarovski crystal star for all to see this holiday season. After the holiday season, the tree will be donated to Habitat for Humanity and milled into lumber. Those of you planning to make it to the Christmas tree lighting ceremony in New York City, go the easy way with the Long Island Rail Road. The tree lighting ceremony will also be broadcast on television from 7 – 9 p.m. on Wednesday, December 2nd on NBC. 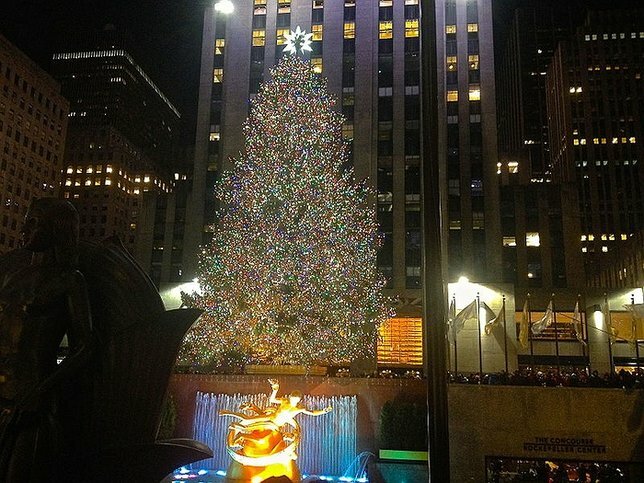 Are you planning on heading to NYC to go see the 83rd Annual Rockefeller Center Tree lighting? If so, send us your pictures & we'll add them to our upcoming Holiday Gallery! Subject: LongIsland.com - Your Name sent you Article details of "The 2015 Rockefeller Christmas Tree Lighting: Kicking Off the Holiday Season Brightly in NYC"